When I was a kid, rubber flip-flops worn anywhere but at the beach or on the boardwalk were considered to be the height of tacky. Somehow we’ve become so utterly casual that rubber flip-flops are everywhere these days. They’re flipping through the office corridors. They’re flopping along the shopping malls. They’re slapping and slopping their way into every location...even in the dead of winter. So...am I okay with that?! Honestly? On one level I’m horrified and on the other I’m sitting here typing in a pair of rubber flip-flops so who the heck am I to judge?! Besides anyone who knows me knows that I LOVE shoes! I’ve taken to the DIY Flip-Flop route after sizing up the price points of the upscale variety online and at the mall. When my daughter and I were shopping she mentioned wanting lace-up flip flops and I put on my thinking cap to make it happen. Here’s the 411 on The Goddess Flip-Flops...and stay tuned because this is the first installment in the Flip Out Flip Flop Summer™ Series! Tie on these saucy sandals when you want to release your inner Goddess. 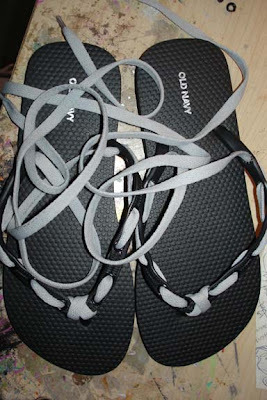 The laces minimize the flip-flop sound to make them a skootch more office friendly. 1. Die cut your grungeboard by tim holtz™ flowers using the Sizzix Big Shot and the Hello Kitty Die. Make two cut sheets. 2. 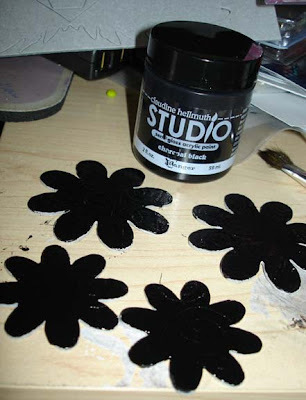 Paint the four smaller flowers black and allow them to dry. 3. 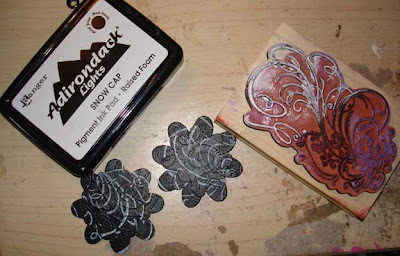 Use snow cap pigment ink to stamp flourishes on surface of flowers. 6. Drill a small hole in the center of each flower. 7. 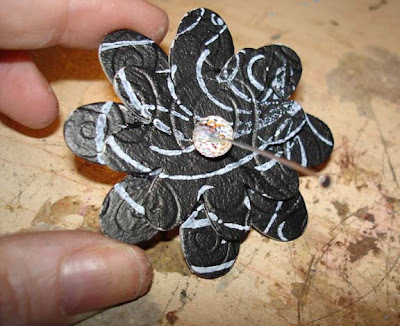 Thread each flower with a beaded head pin. 8. 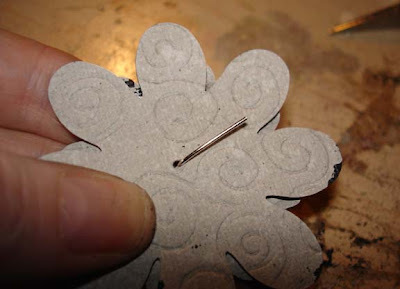 Bend pin flush to the back of your flower and cut to approximately ¼”. 9. Use largest part of round nose pliers to create a large loop at the back of each flower. 10. 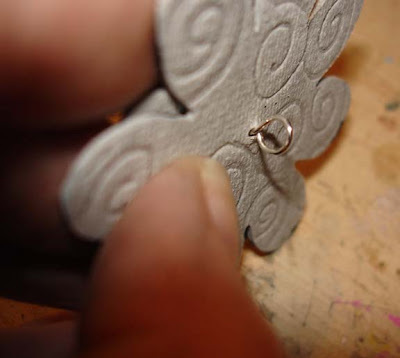 Measure your straps and mark six evenly placed spots for holes on each side. 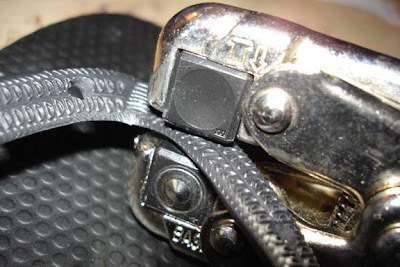 Make the front holes close to the strap fronts and your final hole should rest on the lower side of your foot. 13. Thread a lace into the underside of the outside of one of your flip flops and lace through the holes until you reach the center. 14. 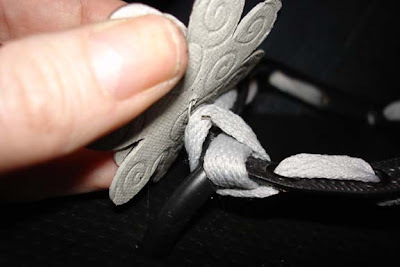 Thread under over, under and over the toe portion of the flip flop criss-crossing the lace into a small x. 15. 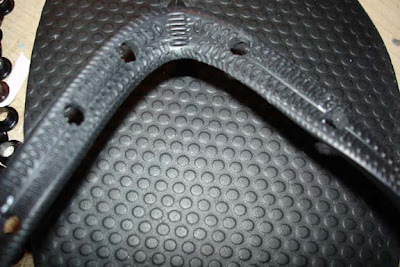 Continue lacing down the outside of the flip flop until you reach the final hole. 16. Repeat for second flip flop. 17. 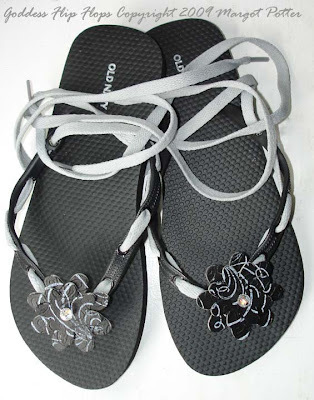 Open and thread the looped flower into the top lace in the x design at the front of each flip flop. Secure closed. 18. Lace on your new creations and go have some fun already will ya?! These are absolutely adorable - and they look even cuter on your feet! :) My 16 year old daughter will love these - this will SOOOO be a summer project for us! Thank you so much for sharing!!! That's crazy! Is this papercrafting or scrapbooking? lol! way to go again! they are amazing! Considering doing embellishment only on my Reefs - can't punch holes in them, but definitely could decorate the straps! Great tutorial! I can't buy most of the "ingredients" here in Egypt but I'm certainly going to improvise. Thanks for the fab idea! One question: will the grungeboard stand up to the elements? What is it made of? Thanks for the kind compliments gals! I had fun making these. You could surely do it with fabric flowers instead! Eileen it should hold fine. I make jewelry with it. It's a top secret super reinforced chipboard material and it can be really abused without ripping or falling apart. 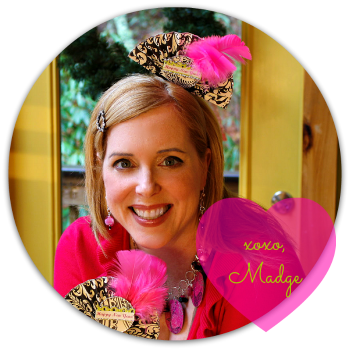 I'm linking to your blog in a post on summer crafts to keep me busy! The flip flops are just adorable, and inexpensive. I'm getting ready for a girls craft day and we may be able to each have a pair of each idea! hi :D I tried out this idea, but didn't use a flower, just threaded on a few pony beads instead. I'm linking back to you tonight! thank you!